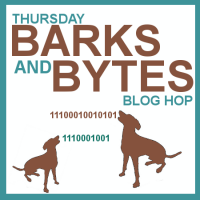 Disability Awareness Series Part 1 | Thursdays Barks and Btyes | Such a precious game of fetch. 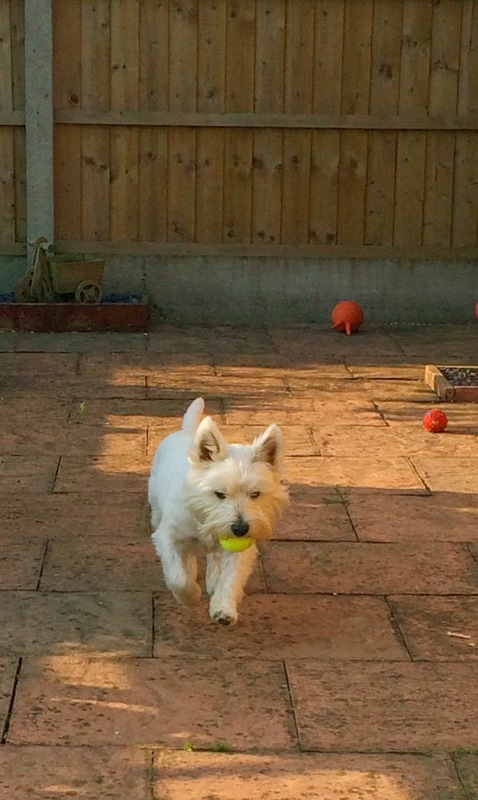 Lottie is such a playful little dog and loves nothing better than a game of fetch with her favourite ball. I had the idea of a dog blog for a while before I started but never had the courage to take the plunge. 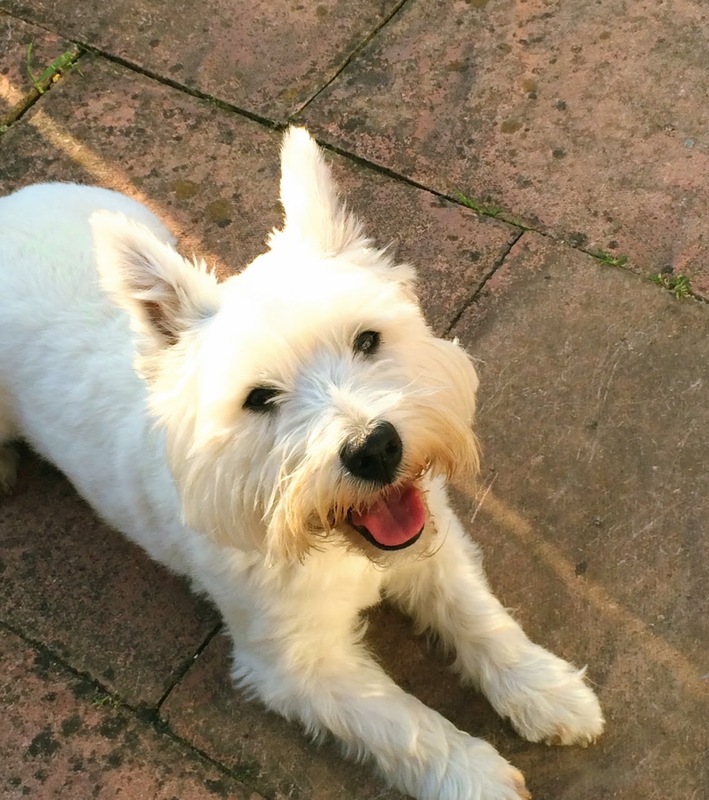 I wrote an article for a dog's magazine with the angle of how much Lottie had changed my life due to my disability. I then realised I could start a dog blog with the aim off showing of Lottie and combining my disability. I will be doing a series of posts labelled. What it's really like to be a disabled dog owner. Many of our followers will know I have just had a major orthopeadic operation to replace a tibia nail in my leg. (There will be an upcoming post with more details of this soon). Because of the seriousness of the surgery it means I have a long recovery ahead of me. After my two weeks in hospital I couldn't wait to come home to see Lottie. However this wasn't quite the experience I had envisaged. At the moment I am basically bed/sofa bound and can only spend around half an hour a day in the wheelchair with my leg rest. This means social time with Lottie is very limited. There is also the huge problem with regards to physical contact with Lottie. Pre-op she is used to cuddles on my knee every night whilst we watch television (after all that's what those human knees are made for!) This is no longer possible at the moment due to the plaster on my leg as it is separated at the knee which leaves my knee scar uncovered! Something Lottie can definitely go no where near! We did however find a way for our important cuddles which you guys will be able to find on our Facebook page. Yesterday I started to feel a little better and for the first time manged to spend half an hour in my chair. 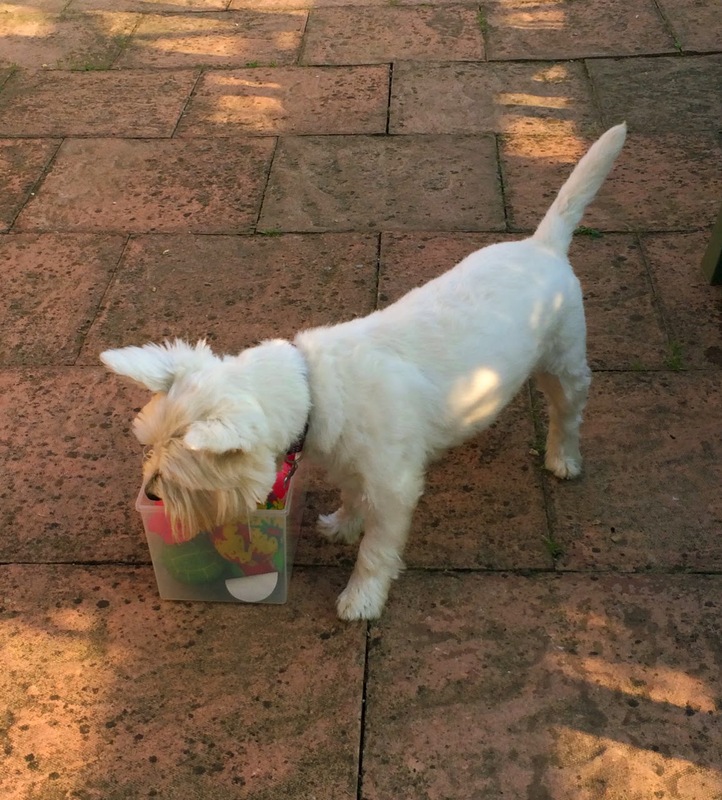 On the plus side for us its summer at the moment and we are having great weather which is ideal for a great game of fetch we even had time for Lottie to practice one of her new tricks of tidying away her toys. 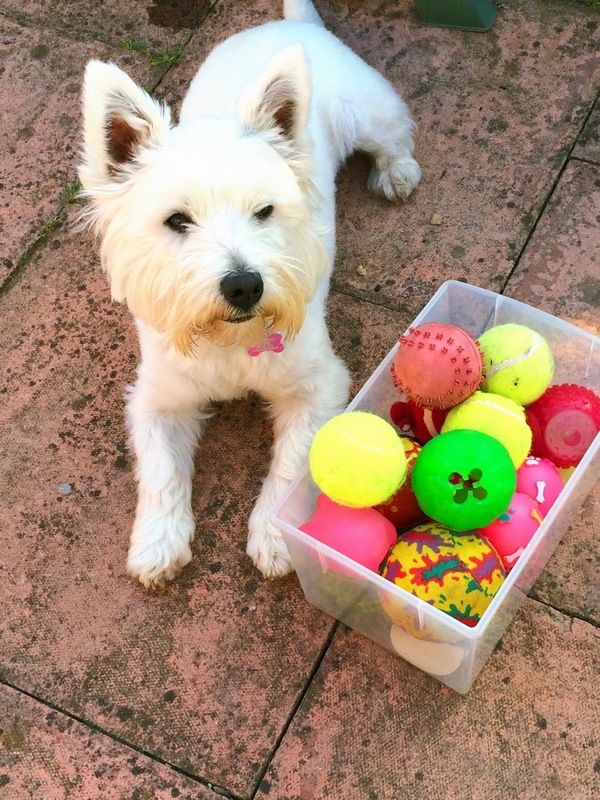 She did really well although one ball was more fun to play with than put away! As you can see Lottie was over the moon that our usual routine had nearly resumed to normal. Please mum throw it again! I really don't want to put this one away, its so fun. Look mum I put them all away! 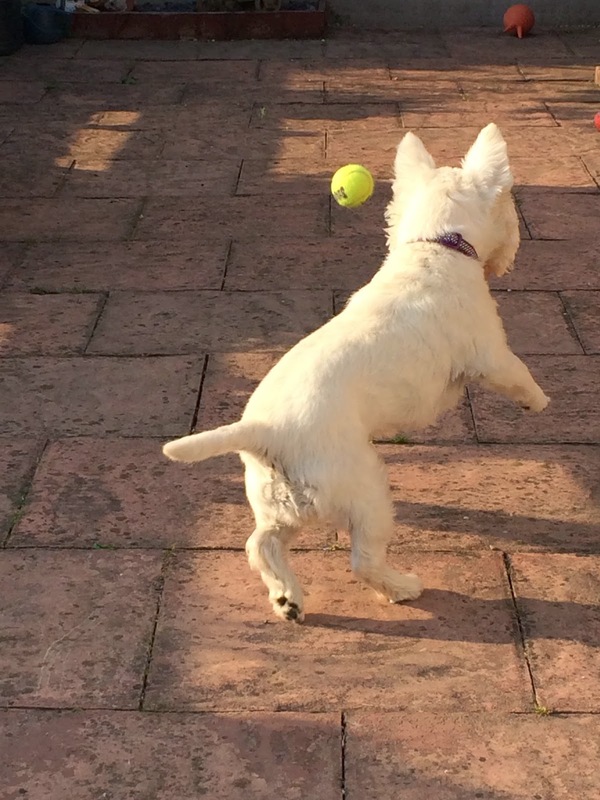 Head over to our Facebook page to see a video of our first game of fetch in over two weeks! You wont be dissapointed! 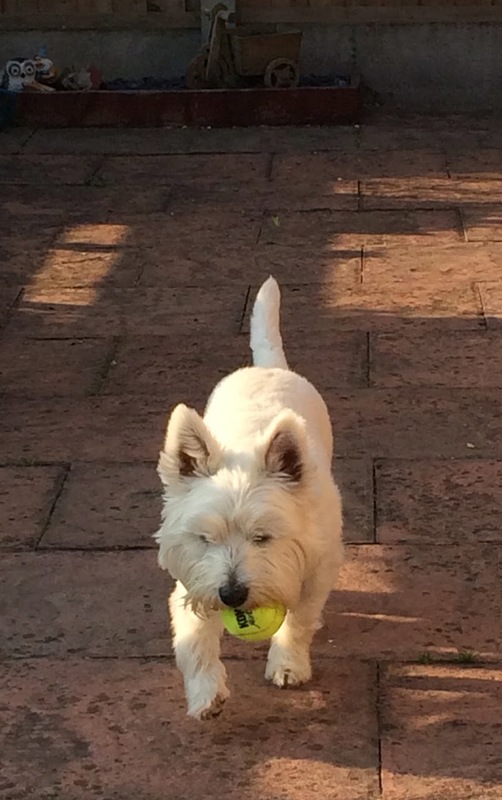 Please don't take for granted a game of fetch with your dog (even if he/she doesn't bring it back) as some of us would give anything for that special time! I've always considered our time together a gift. There is no way of knowing which of us human or dog will have challenges that make that time more difficult. I wish you the best as you walk this path. I hope you both find ways to share the journey and grow closer. 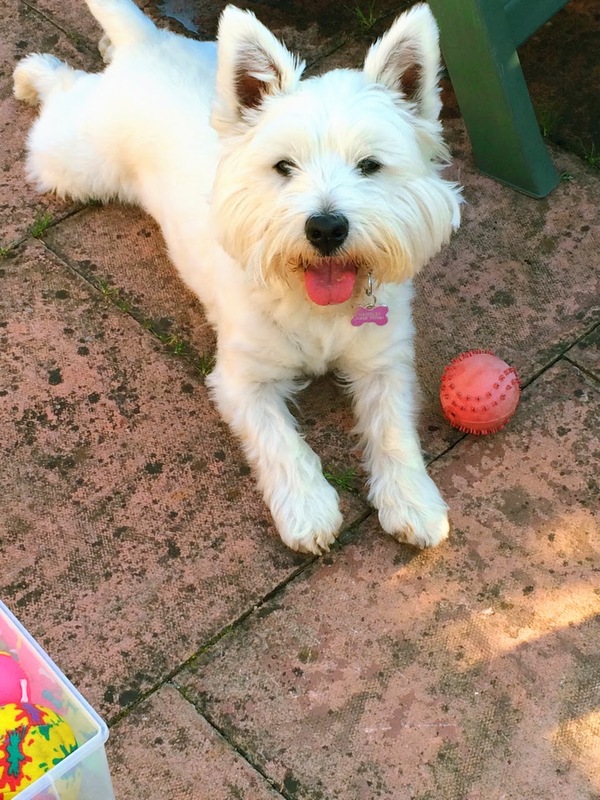 Hi Jessica and Lottie, it's nice to meet you and thank you for joining the blog hop!! It's so hard when our pups are sick and can't play the way they normally do, but I never thought about the times the human is incapacitated. :-( I'm sorry your surgery will have a long recovery process but I'm hoping it goes by quick for you so you and Lottie can get back to your routines.